If you are searching for an enriching activity for your infant or toddler, then consider our Baby and Me class. Baby and Me offers a wonderful opportunity for parent-child bonding and provides a sense of security and attachment, which fosters positive self-esteem. You will interact with your child by singing songs and participating in the activities offered by our wonderful teacher. Infants and toddlers acquire listening skills with rhymes and finger-plays, clap hands to the rhythms, and take turns ringing the welcome bell. A great way to meet new people and create friendships with other parents, many play dates have been arranged amongst those attending. An interactive class is the perfect introduction to a school setting for very young infants and toddlers. 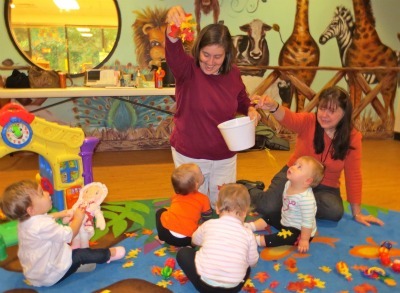 Baby and Me playgroup is offered on Thursday mornings from 10:00am-11:00am for infants and toddlers. Two Year Olds "age out" of the program. Temple Israel membership is not required to attend Baby & Me. Enrollment is free. Registration is required, plus proof of immunization. Baby and Me is made possible by the generosity of Jewish Community Partners.